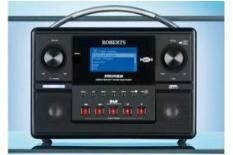 Roberts Stream 83i review | What Hi-Fi? The Stream 83i may not win any beauty contests, but there are immediate benefits to the big, bold buttons on the fascia. Compared with neater rivals, this is simple to use, and all controls act with a slick positivity. Specification is reassuring too: a planet's-worth of radio stations, wired and wireless LAN connectivity and a USB input is all good news. Only the lack of an iPod dock could conceivably cause concern. This sensible, thorough approach is mostly carried over to the sound the 83i makes. It's as poised and informative through the midrange as its best rivals, and low frequencies, though not the most generous, have body and purpose. It's a gratifyingly swift listen, but ultimately denied a fifth star thanks to its insubstantial way with treble sounds – they're thin and reedy. It's not a huge flaw, though, and should be taken in the context of all the things the Roberts gets right.